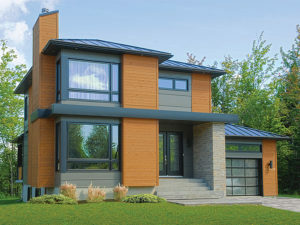 Building modern house plans is a growing trend from the East Coast to the West Coast and everywhere in between. These modern designs are usually recognizable for their unique and futuristic architecture. 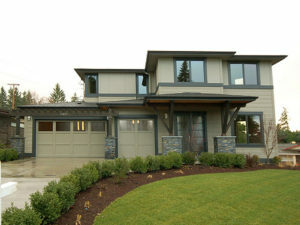 Modern house plans are available in a broad range of sizes and typically offer up-to-date amenities. While our collection of modern house plans continues to grow, we would like to share a few noteworthy modern house plans with you. 072H-0198: Check out the clean crisp lines of this modern house plan. 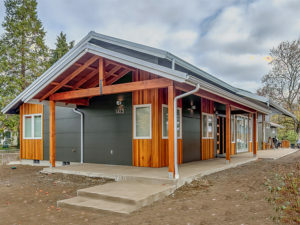 It is sure to fit in anywhere as a stunning vacation home whether it is built by the lake or on a mountain top. An open floor plan provides efficient and comfortable spaces for dining, lounging and cooking. The kitchen features an efficient island. Cozy up to a fireplace/woodstove in the living room or the master bedroom. The full bath offers a soaking tub and separate shower, a feature not common in a home of this size. No need to take dirty clothes home at the end of your vacation. With a convenient laundry room laundry chores are a snap. Make this neat modern house plan your home away from home. 027H-0336: This modern two-story house plan is trendy and fresh. Large windows admit natural light into both levels of the home. What great views they create for the great room and master bedroom! Living spaces stay connected as does the modern family with this open floor plan. Whether grabbing a snack at the kitchen island, watching movies in the family room, or napping in the great room, family members can be close at hand. The second floor provides a master bedroom and two secondary bedrooms arranged with privacy in mind. A deluxe bathroom accommodates everyone’s needs and a convenient laundry closet completes the plan. 035H-0087: Visual excitement is created by this modern house plan with its many layers of repeating geometric shapes. Exciting exterior spaces such as decks and patios only hint to the many treasures to be found inside. A space-age semi-circular food bar in the kitchen serves both the eating nook and great room with sophisticated coziness. Stylish features and thoughtful extras include a formal dining room, den, media room, and wine cellar. Enjoy five comfortably designed bedrooms, two of which are suites. Top that off with walk-in closets, a wet bar, second-floor laundry, a walk-in pantry, and a three-car garage. Your family will live luxuriously in this modern house plan. 037H-0250: Imagine coming home to this modern Sunbelt house plan with its simply handsome front entrance and friendly drive leading to a three-car garage plus storage. The open floor plan delivers in style with vaulted ceilings, a cozy fireplace, huge kitchen island, plentiful storage, walk-ins, and even a wine closet. Oh! But to be the master of the house! He or she will delight in the luxurious master suite where you can step out onto the covered lanai from the sitting area! Designed for warmer climates, outside spaces are as exciting as the indoor amenities. Enjoy entertaining outdoors, grilling on the lanai, or taking a dip in the pool. Now that’s living! 051H-0246: Sleek clean lines, with an eye toward minimalism, define this simple yet gracious modern house plan. Taking advantage of the gabled roof, the dining and great rooms as well as the owner’s suite boast vaulted ceilings. The kitchen features a large island as it overlooks the hearth-warmed great room. A split-bedroom design emphasizes the centrality of this open floor plan while lending a bit of privacy to Mom and Dad. A rear entry garage provides shelter for two vehicles. 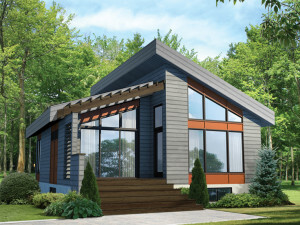 If you’re looking for a modern house plan that fits a narrow lot, this one packs quite a punch! If you liked these modern homes, you’re going to love the rest of our collection. Browse more Modern House Plans now!